"Have the historic achievements of Oscar Temaru's pro-independence Tavini Huiraatira party to internationalize the issue of the effects of French nuclear testing through United Nations resolutions convinced the ruling anti-independence party, (still headed by disgraced former President Gaston Flosse) to reverse its long held position as the historic nuclear testing apologist? This is unlikely, as it appears to be an orchestrated political power play by Flosse who now serves as an 'advisor' to the territorial assembly under control of the political party he still heads. Some see the move as a blatant attempt to undermine (French Polynesia) President Edouard Fritch at the precise time he was meeting with French President Francois Hollande in Paris. Amazingly, Fritch has stated that he did not know of the legislative initiative in advance. This speaks to the continued power of Flosse from behind the scenes to dictate political decisions. At the very least, the issue of reparations for the inhumane health and other effects of decades of nuclear testing has been brought to light in the international media. But let there be no mistake that the genuine struggle for reparations as a result of the human rights violations caused by the French nuclear testing continues to be led by Temaru and his UPLD coalition." Moves in French Polynesia to seek a huge compensation payout from France are being met with cynicism by some locals.The French territory's assembly is poised to ask France for US$930 million for environmental damage caused by nuclear weapons testing. The move is being spearheaded by the assembly's new president, Marcel Tuihani, who is seen as a protege of ousted President Gaston Flosse. The publisher of the Tahiti Pacifique monthly, Alex Du Prel, says Flosse is now an advisor employed by the ruling party at the assembly. He says the territory's President, Edouard Fritch, did not know of the assembly's plans and Flosse may be making a power play. ALEX DU PREL: So Mr Fritch went on television last night and he said he was amazed by this motion, that he didn't know know about it, and how you say, he sabotaged the relationship with Paris, which he just spent six months to build up again. Richard Tuheiava, who is a pro-independence member of the territorial assembly, is also questioning the motives behind the motion. RICHARD TUHEIAVA: It has really shown that it was a way to politically undermine the attempt of dialogue that is being reestablished at the moment between our elected president here, Edouard Fritch, and the president of France. There is really something more than strange and we believe that Gaston Flosse is still operating at the back. Richard Tuheiava says French Polynesia should wait to become independent before seeking compensation. RICHARD TUHEIAVA: The principle is good but the timing is not fair or proper or relevant and it is just being used and misused by some people, some political interests here - that is not really connected with the real situation and the needs of the people. The head of the nuclear test veterans organisation in French Polynesia, Mururoa e tatou, Roland Oldham, says it is just a political game. ROLAND OLDHAM: For us it is a scandal, because they never talk about the victims and their only concern is to get money for the Government. Roland Oldham says the process of seeking compensation must be done properly and there is still work to be done. ROLAND OLDHAM: We all agree that there is something to be done about compensation but that has to be talked [through] seriously. There is study to be done about all the people who are sick today, there are all these evaluations to be done. Roland Oldham says the Government cannot simply wake up one morning and make such a claim. The motion to seek compensation will be put to the vote this week. Between 1966 and 1996, France carried out 193 nuclear weapons tests in the South Pacific. The French Polynesia Assembly is preparing to ask Francois Hollande’s government for nearly a billion dollars in compensation for damage caused to the islands by nuclear weapons tests. Conservative anti-independence Tahoera’a Huiraatira party committee has apparently taken issue with the French testing regime that saw 210 nuclear tests conducted from 1966 to 1996 off secluded atolls in the south Pacific. The committee, which is acting independently of Polynesian President Edouard Fritch, is asking for US$930 million for environmental damage, according to daily Polynesian newspaper La Depeche Tahiti. In addition, the proposed resolution also seeks an additional 132 million for the continued occupation of the Fangataufa and Mururoa atolls. France detonated its first thermonuclear weapon off the Fangataufa atoll in 1968, after ruling out other locations – such as the Sahara – and the decision was broadly accepted by the Polynesian public at the time. Last year declassified French defence documents exposed that the islands had been hit with far more radiation than previously supposed. Tahiti - the most populated island - was exposed to 500 times more radiation than recommended. In 2006 a French medical body found the increase of cancer on the islands were caused by nuclear testing. The French government only acknowledged veterans and survivors in 2010 that they would be legible for compensation - but warned the process would be long and complex thanks to the distribution of the islands. Environmentally, the islands appear to have been badly affected by the testing. However, for years many scientists and researchers were refused entry to the islands and to this day much of the data on the proliferation of waste remains incomplete or unavailable. In 1998 one report indicated that more than 3,200 tonnes of various types of radioactive waste had been poured into the Pacific ocean, sinking to depths of 1,000 metres off the coast of Mururoa and Hao island. Marcel Tuihani, a protégé of the founder of the anti-independence Tahoera’a party Gaston Flosse, is leading the claim. The politician, who is affectionately referred to be in local media as the ‘Old Lion’, was convicted of corruption in 2006 and given a three-months suspended sentence during which time he neither resigned nor gave up his seat in the Polynesian senate. He was reelected to the Senate in 2008. French Polynesia is an overseas collective of French Republic and is located south of Hawaii in the South Pacific Ocean. Among its 118 islands, 67 are inhabited. Tahiti is the most populous island and contains the capital Pape’ete. 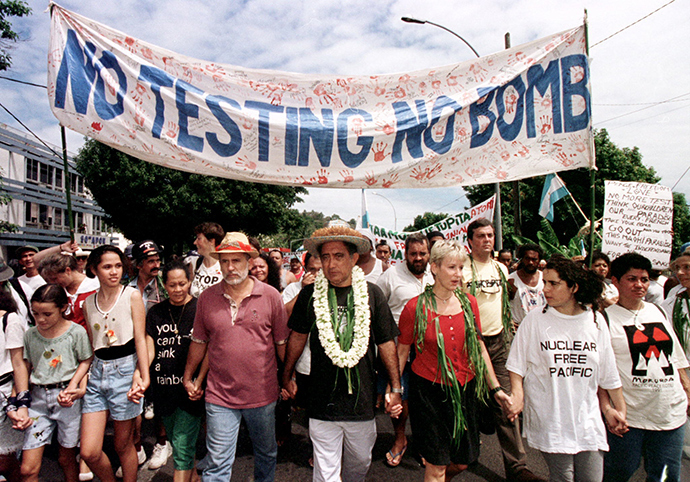 The above demonstration was led by Oscar Temaru (centre), former President of French Polynesia, and longstanding anti-nuclear advocate.